Dubai, United Arab Emirates: Dubai Culture and Arts Authority (Dubai Culture), the Emirate’s dedicated entity for culture, arts and heritage, is participating at the 36th GITEX Technology Week, held 16 – 20 October at the Dubai World Trade Centre. The Authority is showcasing a number of its IT applications and smart services including a recently updated application for Dubai Public Library, the Dubai Culture and Arts Authority smart application, and ‘Creatopia’ – the government-empowered virtual platform for the creative community. Dubai Culture’s participation at GITEX demonstrates pilot project which uses ‘light fidelity’ technology for internet connections at its cultural and heritage sites. The visible light communications system runs wireless communications travelling at very high speeds. Following the pilot installation of the projection, the Authority will explore the possibility of implementing this technology across all of its cultural and heritage sites and facilities. 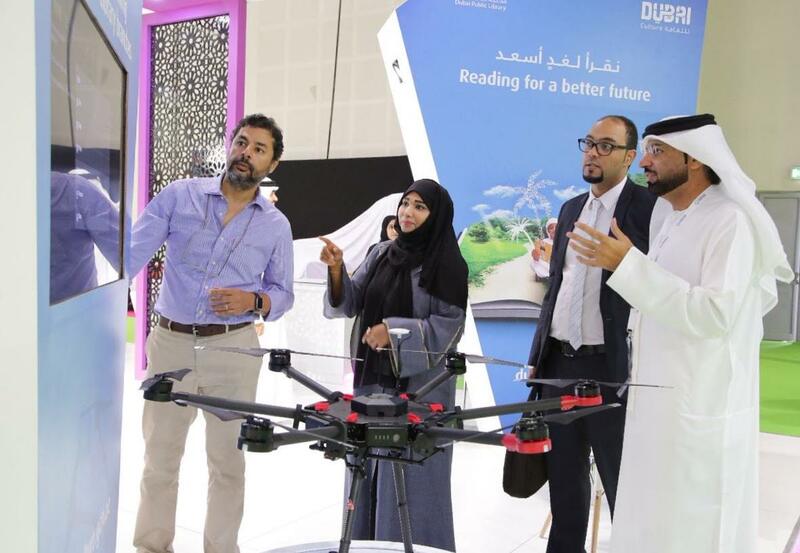 The Authority is also revealing the modified version of its website, as well as a new service to transfer books between the branches of Dubai Public Library on board remote auto-piloted drones, marking a first of its kind in the world. Acting Director General of Dubai Culture & Arts Authority, His Excellency Saeed Al Nabouda said: “Dubai Culture embraces the very latest in technological advances in order to engage with customers and visitors. Our IT initiatives are part of our efforts to promote and implement the directives of Dubai’s wise leadership around further driving innovation across our offerings. Furthermore, the Authority efforts have recently been recognised with an ‘ISO’ certificate for Information Technology services as a testament of its commitment of providing the best services to our visitors. In addition, the Authority continues developments to its services aim towards contributing towards raising the levels of happiness and well-being of all segments of society.” Dubai Culture is also providing a demonstration of the online creative platform Creatopia at GITEX. This interactive initiative is designed to promote partnership, engagement and collaborative communication within both new and established members of the culture, arts and heritage communities. Additionally, the Authority is showcasing the updated version of the Dubai Public Library application, which provides a whole host of services to library members and public users. Acting Director of Information Technology Department of Dubai Culture & Arts Authority, Mohamed Yousif Al Hammadi said: “Our participation at GITEX provides us with an ideal platform to understand all of our target audience’s interests and preferences for technology services – including government agencies, visitors and customers. The solutions that we are showcasing demonstrate our ability to keep up with the latest technological developments, and communicate with younger generations in a way that suits them – especially in light of the high use of smartphones among this important target market”. In addition, all visitors to the Dubai Culture stand will have the chance to win an iPhone smart device, with lucky winners announced at a draw towards the end of each day at GITEX.